Jack Flash #5 is derived from the Jack Herer genetic lineage. 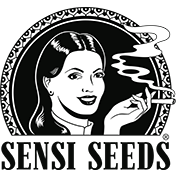 To create Jack Flash #5 Sensi Seeds used the most sativa pheno-type of Jack Herer and crossed it with Super Skunk and Haze. Following several generations of selection and back-crossing Jack Flash #5 was born. The result is 65% sativa, 35% indica. The result of this breeding programme is a plant with many of the attributes of Jack Herer but one which is as easy to grow as a Skunk plant. During the feminisation programme it was then further crossed with an especially fruity male plant. The uplifting high lacks none of that of Jack Herer but with bigger, bulkier yields and unlike its ancestor this one has two pheno-types in place of four. The first is a tall, fast-growing sativa pheno that should be flowered early to restrict height where this might be something of an issue . Growers should aim for a finishing height of at least 100 cm. in order to harvest typically long, "running" sativa buds. The second is the indica pheno-type which is a shorter, stockier plant which is eminently suitable for SoG set-ups. The terminal buds of this latter pheno develop massively-swollen calyxes forming multi-pointed crowns at their tips. Jack Flash #5 is suitable for indoor cultivation and also for outdoors too as long as the climate is war, dry and sunny. A Mediterranean climate is ideal for this. Indoors flowering takes between 55 - 75 days depending on the pheno-type and yields are very heavy. The aroma/flavour during growth is of lemon and this becomes much stronger when the buds are dried and adding notes of orange, bergamot (Earl Grey tea), mint and pine flavours. The effect is of a powerful initial rush that sativa connoisseurs love so much tempered by the indica side. It levels out into an uplifting, cerebral high that is very social and good for conversation. It is also recommended for therapeutic usage being efficacious in the relief of stress, anxiety and depression. Jack Flash #5 was awarded 3rd Place in the Overall Category at the High Times Cannabis Cup (HTCC) 2004 as well as winner of the Seed Company Hydro Category at the 2007 High Life Cup.